How to make a UI for calendar with vacancy? I am building a website for a tour company. There is a tour every day and the maximum number of participants is 20. 1) How would you show the dates with with taken+available places that there are for each day? 2) Since prices are different for each day, how can I add a price for the tour for that day as well? 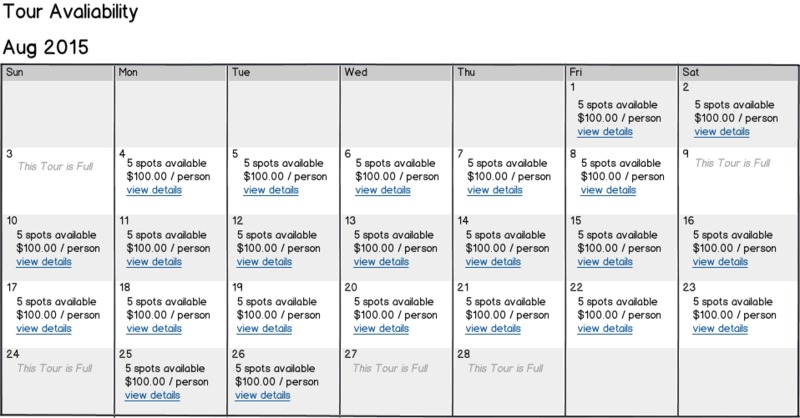 I'm going with the assumption all calendar days offer the same tour, 1 tour a day, happening at the exact same time. But some days are more expensive than others. Price is set per person/seat. You would like visitors to sign up for a seat. Because you're showing a couple pieces of info for each day. It's likely going to be too cluttered/confusing to try and pack all of this into a single calendar. I would recommend a 2 page approach to help solve probably your main goal of getting visitors to sign up. The basic info that influence the visitor's decision goes onto the calendar: Date Available, Price, # of Seats remaining. Then if the visitor is interested in a particular date, they click into the details page for the day. That'll allow them to read up on the particulars of that day's tour, including time, tour size/number of people already signed up etc. This will lead naturally to your call-to-action at the end there for them to move on with signing up/booking. Depends on the a couple of things, but because it's a calendar I'd probably make sure that you saw a month view with a small link that displays how many available slots there are left on every single day. Any full days should be highlighted in a different color, with potentially the option to reserve a spot if anyone cancels. Then when selecting the link to sign up for an available slot, it would show a day/week view with all currently taken slots, and users should be prompted to click in open spots. Calend.ly is a good example of some of these, and various other tools have other functions I suggest, like Asana. Not the answer you're looking for? Browse other questions tagged dates calendar or ask your own question. How to improve calendar event containment? How to note that a ticket price is not the final price? Events list or calendar view?